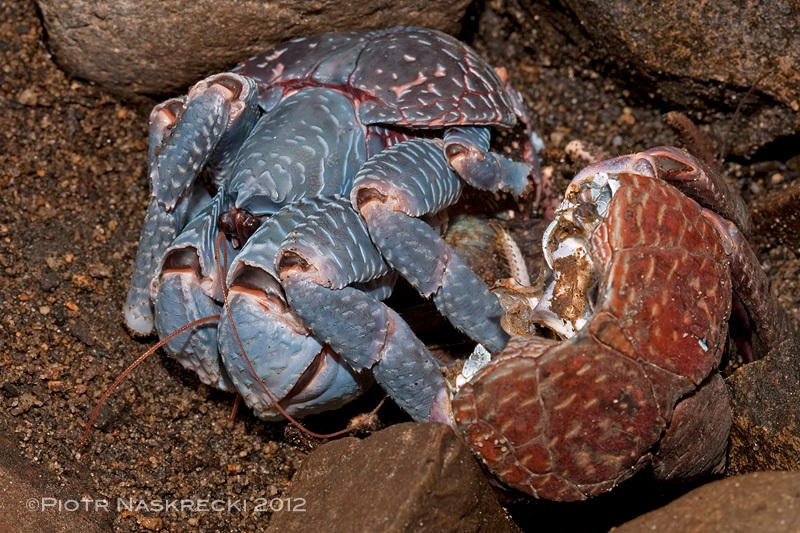 While I can honestly say that there is no animal that I find uninteresting, none is higher on my list of the most amazing animals than the coconut crab (albeit this top place in my ranking is shared by many.) 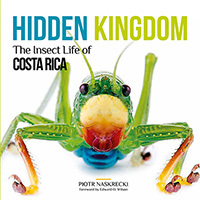 The first thing that you will notice about this crustacean is of course its size – it is huge. In fact, with the maximum leg span of 1 m (~3 ft) and weight of 3 kg (6.6 lb), it is the largest invertebrate animal you will find on land. 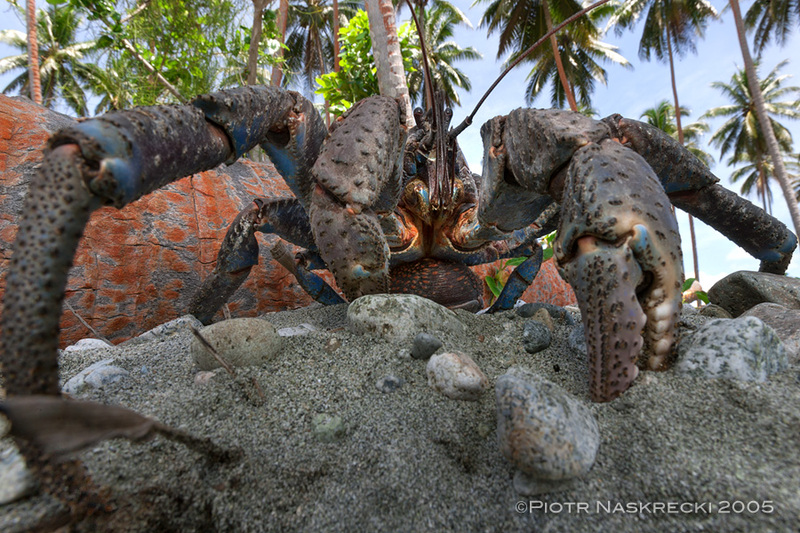 There exist larger marine crustaceans, and there are many much larger cephalopods, but on dry land the coconut crab is the undisputed champion. 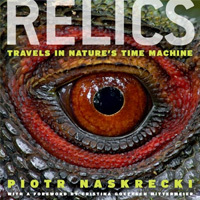 It is also incredibly long-lived, for a terrestrial invertebrate, reputedly capable of reaching the ripe age of 40 years. From the taxonomic point of view, coconut crab (Birgus latro) is more closely related to hermit crabs (infraorder Anomura) than true crabs (infraorder Brachyura), and you can tell that by, among other things, the presence of only 4 pairs of walking legs (true crabs have 5 pairs.) Another giveaway is its life cycle – following a brief period as pelagic larvae, young coconut crabs carry a shell, just like other hermits. 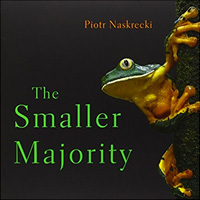 Only after reaching the size of about 10 mm the young abandon the shell, and begin to resemble the adults. 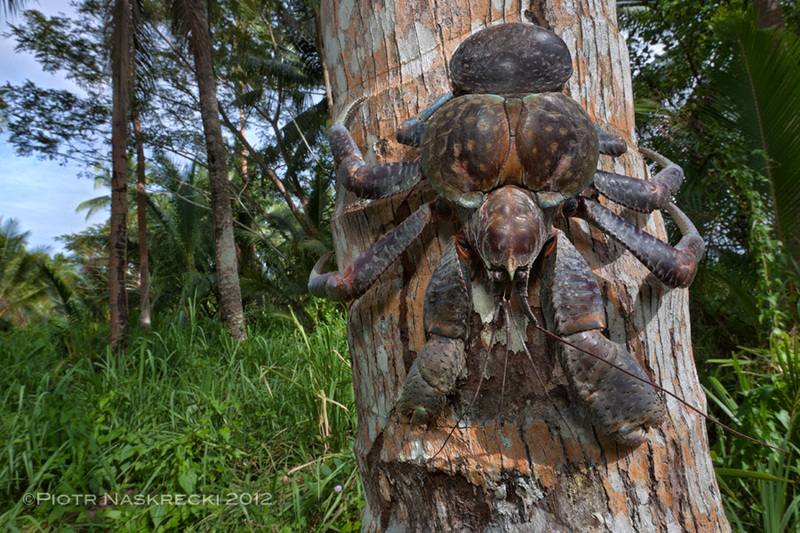 The transition to the terrestrial lifestyle is more complete in the coconut crab than in any other land hermit. Not only did this species eschew a protective shell of a snail, thanks to its hard, resistant to water loss abdomen, but its senses are more akin to those of insects than crustaceans. All other terrestrial hermit crabs can only detect smells if the air humidity is very high – their olfactory organs are still those of an aquatic animal, and can only respond to chemical cues if they are dissolved in water. Coconut crabs, on the other hand, can smell things in dry air, indicating the development of land-adapted olfaction. Despite the common name, coconut crabs don’t feed only on coconuts. Like many decapod crustaceans, they are opportunists and will eat anything organic that they can put their powerful claws on (so powerful are their claws that you can easily lose a finger if you are not careful when playing with one.) In addition to cracking coconuts, they have been known to hunt shore birds sitting on their nests at night, steal dog food from people’s backyards, and will gladly eat any kind of carrion. This last habit had them implicated in the disappearance of the famed pilot Amelia Earhart, and you can sometimes hear speculations that her body might have been dismembered and eaten by coconut crabs somewhere around the archipelago of Kiribati after her plane’s crash. 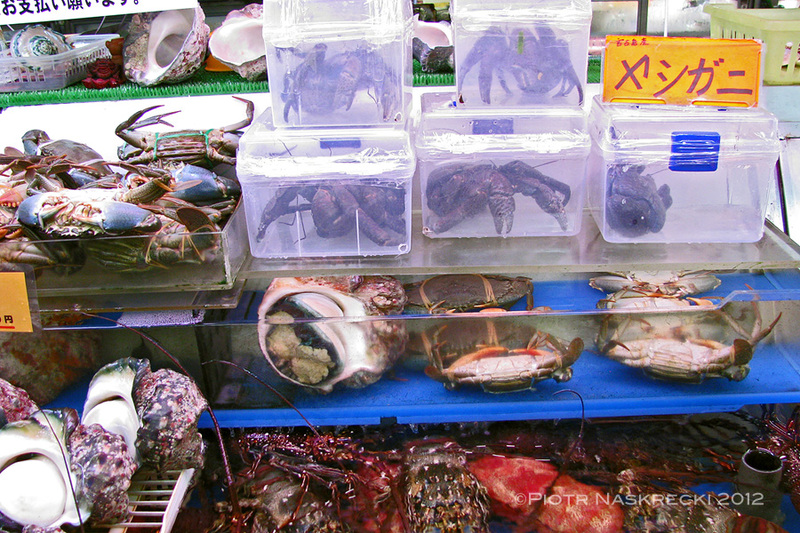 Even if true, it is the crabs that suffer more from our appetite for crustacean flesh than the other way around. Their meat is purportedly deliciously coconutty, and there is plenty of it in an animal of their size. 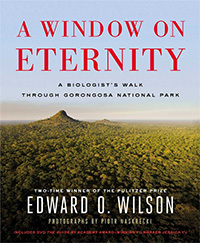 Nor surprisingly, they have been overharvested within most of their range around tropical islands of the Pacific and Indian Ocean, and have virtually disappeared from many places where they used to be common. 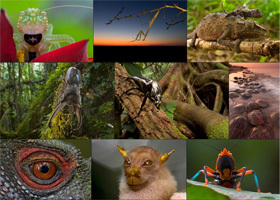 Many countries that still have these magnificent animals now have laws protecting them, or at least limiting their harvest (one of them is the United States, which protects the crabs on the island of Guam), but an official conservation assessment of this species across its entire range has never been done. 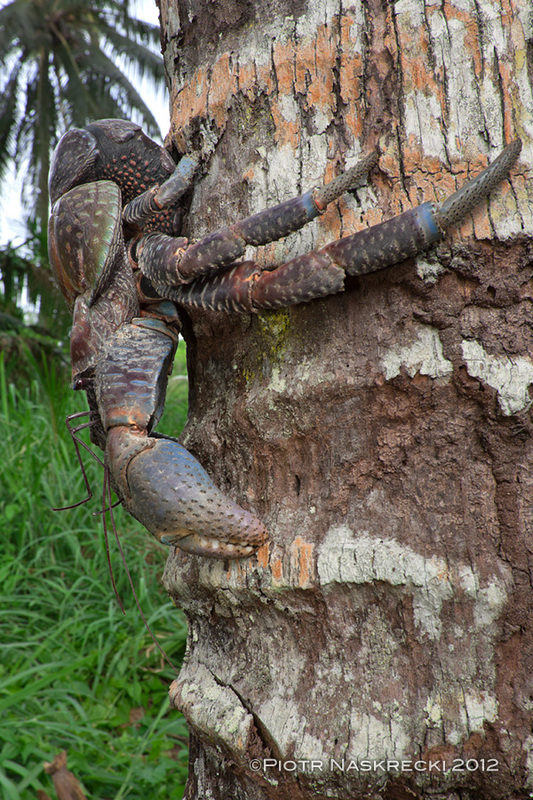 Therefore, the coconut crab is still listed as Data Deficient by the IUCN Red List, and its trade is not regulated by CITES. Hopefully this will change in the near future, it would be an unforgivable tragedy to lose this wonder of crustacean evolution. Thanks for sharing, again! Your posts are always interesting with great pictures and delicious information. Great stuff, and what an incredible animal! I’ll have to show this to my students (first year biology students) when I teach them about arthropods. Excellent blog…as always! Do you know if there is much trade of these animals between countries? If so, and if it is contributing to the decline in the species, then an arguement could be made that it should be added to CITES Appendix II. Too late for CITES CoP 16 (which takes place in March 2013) but it could be worth considering for CoP 17 in another 3 years. I can speak from personal experience, they are delicious. While living in Samoa, decades ago, I feasted on these crabs occasionally.